The Canadian Government announced 3,900 Invitations to Appeal to Express Entry applicants with a score of C.R.S 443 or higher on Jan 23. I.R.C.C has now announced 7,800 Invitations to Appeal in the initial 23 days of the year. It is the most significant invitations number declared in that time-frame since the system of Express Entry beginning in 2015. I.R.C.C used the rule of tie-break in the Jan 23 Express Entry Draw. The time stamp announced was Jan 2, 2019, at 03:55:26 UTC. It means that all applicants with a score of C.R.S over 443, similarly those applicants with a CRS score of 443 who accessed their profile in the pool of Express Entry prior to the decided date and time, obtained an I.T.A in this current invitation round. Applicant profiles are provided a score depends on the Comprehensive Ranking System (C.R.S), which gives points for several factors such as education, age, work experience and knowledge in English or French. The highest-ranked applicants are drawn from the Express Entry pool by normal invitation rounds and get an I.T.A. 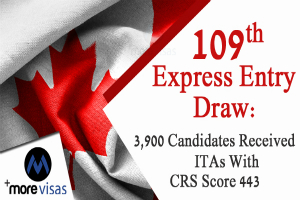 Applicants with C.R.S scores that are lower than the minimum drawn can exercise steps to increase their ranking in the pool of Express Entry. Applicants who get an I.T.A have 60 days from the receipt date to provide a complete Canada PR application to the Canadian Government.